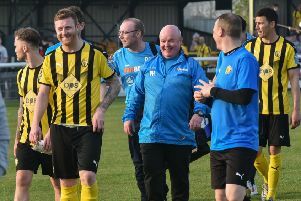 Leamington boss Paul Holleran says a lack of cutting edge and not pressure was to blame for Saturday’s defeat to Frome. Having worked so hard to get within touching distance of top spot, Holleran’s side were found wanting when it mattered, succumbing to a 64th-minute goal from Jake Jackson. “We didn’t play as much football as we’d have liked but creativity-wise we had enough chance to win two games,” said Holleran. “But at this stage it’s all about results. “The Saturday before at Hitchin we had chances that we didn’t take and against Cinderford we should have been two or three up in the first half. “In the last week we haven’t been clinical enough in the final third. “It’s hard to be critical, though. Holleran did concede, however, that there was a tension around the Phillips 66 Community Stadium on Saturday at a time when fans should be enjoying the run-in. “My priority is to get enough points on the board to get second spot. “If Chippenham have a little wobble we’ve got to be there to take advantage. “We should be looking after ourselves and we should be enjoying it more. “You could feel the tension around the place on Saturday. “There’s loads to look forward to, though. Darren Pond will be back for Brakes tomorrow having missed the Frome defeat while on best-man duties and Richard Gregory is set to return to the fold having spent the last two games getting game-time at Walsall Wood. Ben George is still struggling with a hamstring injury.